Or whatever fancy recording equipment you use. Or, if it is biologically possible for you, simply stay up late Wednesday, December 20 and watch the Colbert Report. because it is going to be the most important show of the year. Thanks to the ever-vigilant Will at the Record Room, I first became aware of a festering feud between Stephen Colbert and my beloved Decemberists. Seems Colbert had taken issue with the fact that the Decemberists had filmed their video for O Valencia! against a green screen and were inviting fans to re-animate the video for them. In a segment entitled "Who's Riding My Coattails Now? ", Colbert argued that he had in fact invented the green screen challenge with his light saber video and that the Decemberists were nothing but a bunch of sneak thieves. He called upon viewers to edit him into the Decemberists' video where, with his light saber, he would "slice off their legs at the knee". Things, as they often will, escalated. Colin Meloy then issued a counter challenge via Pitchfork by issuing the "Very First Decemberists vs StephenColbert Guitar Solo Challenge", with this slap in the face: "Let's see what kind of man you really are - Let's SHRED!" "To further rub salt in the wound, Decemberists' HQ issued the memorandum that "we already played out the light saber thing months earlier, live and on stage-- sans animation, stunt double and fancy green screen-- with pure rock, sweat and C batteries." Ooooh, fightin' words! And just when you thought it couldn't get any weirder, the intrepid Hilary alerted us to the fact that Colbert had accepted the Decemberists' counter-challenge, and that they will appear on the Colbert Report Wednesday night to compete in a sure to be legendary guitar solo challenge. Colbert claims to even be giving the band "home-field advantage by having the contest in December." "I'm going to dust off my white high-top Reeboks, slide on my stirrup pants and chug a two-liter of Mountain Dew." THat is hilarious - I'll set my DVR tonight. Very clever, those chaps. Oh man! This is good!!!!! I hope I don't forget tomorrow! Sounds like fun! I love a good feud. I'll have to set my VCR now otherwise I'm liable to forget between now and then. Oooo oooo! Does anyone know exactly when this airs here? Come on Barbara, work your mojo for me! Karen, it's on CTV at 12:30 am on the west coast. Hopefully that helps. That's one of the things I love about both the Decemberists and Stephen Colbert, Phlegmfatale - the savage cleverness. I hope I don't forget either, Mel. That would be horrible and beyond embarassing. Not a bad idea, Toccata, I should go set mine as well. Come to think of it, I don't think I've switched it over from Daylight Savings Time yet either. hahaha John, that wouldn't surprise me all that much. You know if anyone would go that route, it would be those dudes. Thanks Toccata, I appreciate the info; I think it's on the same time in Alberta. Karen, we're working with Toccata's mojo today. I saw the preview last night and thought of you. I am going to watch it for sure. Arrrrgghhh! I don't have a VCR, nor can I stay up that late. I'll have to wait to see them replay it on the comedy network later. Nuts. I'm so excited about this, JACC. I hope the whole band comes on the show to cheer Chris on, as I am madly in love with all of them. Oh nose, Karen! 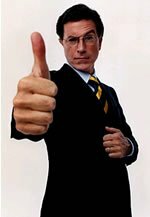 I noticed that Colbert is also on in the morning, around 10ish, but I don't imagine that does you any good. I'll bet that Pitchfork will post something, as they've been instrumental (no pun intended) in advertising this. Well, I realize that I'm commenting after the fact, but I certainly had you in mind when posting the video. Of course, these days, you and Decemberists are pretty much always in the same sentence. It was pretty classic, though. Truly a match made in heaven. Did you see the show at all, Will? It was brilliant. Chris Funk is the unlikeliest looking guitar god you could imagine. And Colbert, well he's Colbert, isn't he? I am pretty mad for the Decemberists these days. I won't deny it! Thanks again for first finding this.